Wargroove could easily be a sequel to the popular but seemingly entirely A.W.O.L. Advance Wars series. It is more than a homage, with the general turn-based combat feeling satisfactorily almost exactly like Advance Wars. The main initially noticeable departure is the theme switching from a military base to a more fantastical setting filled with magic and the undead. When talking to the developers at Rezzed they were unashamed in freely admitting that they were not only inspired by Advance Wars but inspired to make a game of this style because of its absence. Copying a popular formula might have been harder to swallow if it was not for the fact that this facsimile is designed quite so well and quite so feature complete. I liked the idea of the recently released art style of Paper Wars: Cannon Fodder more than I liked the execution but graphically Wargroove is much more akin to the Advance Wars source material, albeit in a higher resolution suitable for TV screens. 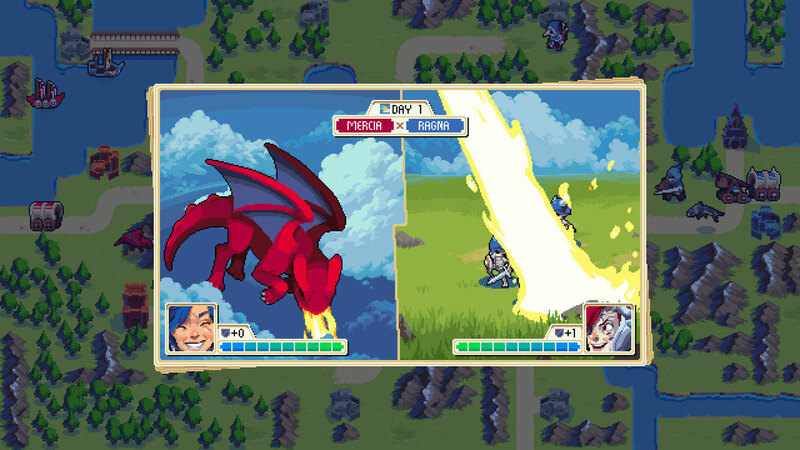 At Rezzed, Wargroove was demoed on an Xbox in the ID@Xbox section but, given how closely I relate AW with a Nintendo handheld, I could not help instantly associating this with playing on the Switch — but also good news for fans of the series currently without access to Nintendo’s console and also confirmation that it should be fine to scale up to TV size when docked. Anyone familiar with Advance Wars will recognise the back and forth of the turn-based combat with animations showing the two opposing sides battling each other taking up a vertical half of the screen each. While each squad is represented by a single troop on the main overall map, going into the combat animation shows the actual number of troops in that squad and the number of units lost on both the attacking and defending factions during a combat phase. There has been some tweaks and adjustments to the classic Advance Wars formula as well as some larger scale additions to the functionality and features. Some of the smaller tweaks relate to how (initially neutral) buildings are captured. In Advance Wars these were tower block style buildings that troops conquered with an animation that sees them squashing the building in question and possibly taking a number of turns to conquer and eventually occupy. In Wargroove, a squadron can easily conquer an unoccupied castle and then leaves some troops behind to defend the building, seemingly without reducing the number of troops currently in that squad. An animation that is very similar to the combat animation is shown with the troops marching into the castle. Likewise a similar type of animation is shown when attempting a battle to conquer an enemies’ castle. The presentation is not going to make much difference but not having (or not being able) to occupy a building to conquer it – and especially not gaining the protection that comes with doing so – should make a large difference to the tactics employed in-game. 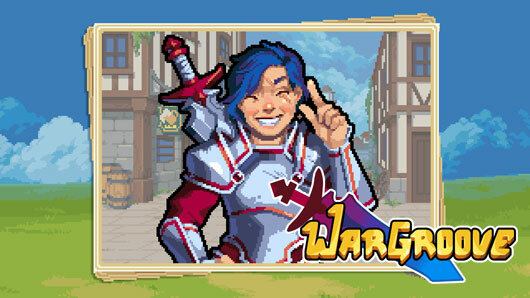 The larger additions to Wargroove are those that sound the most intriguing; local co-op has long been a staple of the sub-genre but I have never played online either competitively or co-operatively and Wargroove offers both options. 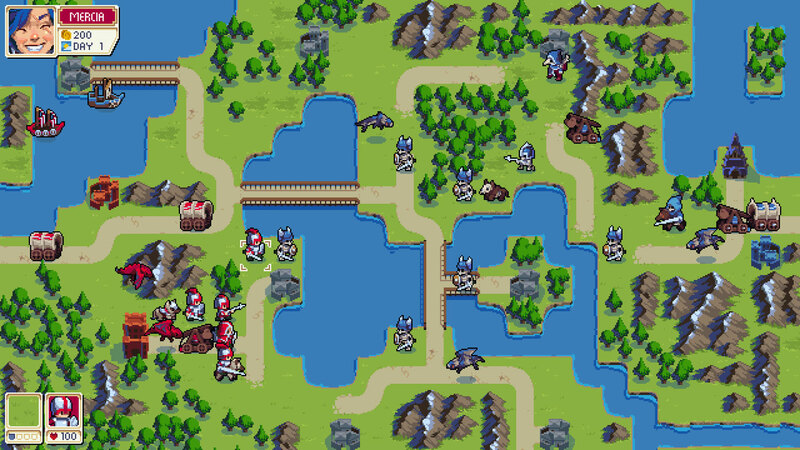 While there has been a few unofficial map editors for Advance Wars, Wargroove will contain a full in-game map editor as well a seemingly full-featured campaign editor that allows players to share new maps and campaigns with other players – an addition that could add a lot of longevity to the game overall. All four of the factions – Cherrystone Kingdom, Felheim Legion, the Heavensong Empire and Floran Tribes – that will be available in the final game were available to play as or against in the demo. The Floran Tribes are taken from a previous game by the same developer named Starbound. There will be (the slightly nebulous) 12+ commanders available and while I did not note this from the demo, I presume that this will give a number of different commanders per faction – which could make a big difference to gameplay as each commander has a unique power (named a Groove) that can be used to turn the tide of the battle in your favour. The commander that I used had a healing power which healed any units in close proximity and appeared to have a cooldown between uses. Ordinary squads can consist of a team of Swordsmen, Archers, Mages, Spearmen, mounted Knights, Transport wagons and (good) Doggies – with larger war machines such as Ballista and Trebuchets and even larger, more expensive giant units such as a Golem. The Air units, which have been discussed and detailed by the devs, were not shown in the demo but include Balloons, Harpies, Witches and (most importantly) Dragons! It also appears that Sea units will also be added prior to launch – with Mermans, Turtles and Boats already listed. There was a time where Advance Wars games were a default purchase for me and after a short time with this demo it became clear that I am already looking forward to getting back into that Groove again.